Hours after Al-Qaeda confirmed that Al-Nusra is a member of its international network, the head of Al-Nusra pledged allegiance to Al-Qaeda. 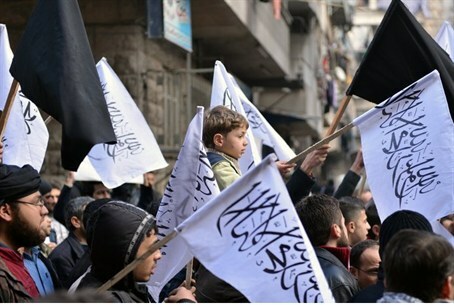 Hours after the Al Qaeda terror organization confirmed that the Syrian Al-Nusra Front group is a member of its international network, the head of Al-Nusra pledged allegiance to Al-Qaeda chief Ayman al-Zawahiri, reported AFP. Al-Nusra's announcement is likely to bolster assertions by President Bashar Al-Assad's regime that it is fighting "terrorists" who want to impose an Islamic state in Syria. "The sons of Al-Nusra Front pledge allegiance to Sheikh Ayman al-Zawahiri," Abu Mohammed al-Jawlani said in a recording. But, he added, "we were not consulted" on a claim by Al-Qaeda in Iraq chief Abu Bakr al-Baghdadi on Tuesday of a merger with Al-Nusra. "We inform you that neither the Al-Nusra command nor its consultative council, nor its general manager were aware of this announcement. It reached them via the media and if the speech is authentic, we were not consulted," he said, according to AFP. Jawlani stressed his group would not change. "Al-Nusra Front will not change its flag, though we will continue to be proud of the flag of the Islamic State of Iraq, of those who carry it and those who sacrifice themselves and shed their blood for it," said Jawlani, acknowledging he had fought in Iraq alongside the ISI, Al-Qaeda's Iraqi offshoot. Jawlani's comments came a day after the ISI announced Al-Nusra was part of its network, confirming long-held suspicions that led the United States to put the group on its terror blacklist. "We don't support the ideology of Al-Nusra," FSA spokesman Louay Muqdad told AFP. Islamist rebel groups such as the Al-Nusra Front have eschewed the main opposition National Coalition.